On April 21st, the Hicksville Board of Ed appointed Carl Bonuso as Superintendent of Schools for the period starting July 1 2015, and lasting through June 30 2018. Read more on the Hicksville School District website. The Nassau County Office of Community development has informed us of a hearing scheduled for May 5th that will cover the County’s Consolidated 5-year plan covering housing and community development needs along with a Strategic Plan for addressing those needs during the upcoming five-year period (FFY2015-2019). They are looking for input from all civics across the county. More details regarding the hearing may be found in the letter issued to the HGCA. If you are interested in attending, let us know. On March 24th, the HGCA’s very own Marie Dunker was awarded the TOB’s Women of Distinction award for her volunteer work. As many of you know, Marie is quite involved in the community, both with the HGCA as well as other organizations. Marie received her award in a ceremony at the TOB, along with the recipients in other categories. Look for her plaque that now hangs at the TOB Town Hall the next time you visit. re-designed the traffic signal control located on S. Broadway (Route 107) at Somerset Ave and Lewis St.
crosswalks making this a much safer intersection for both vehicular and pedestrian traffic. Traffic is running much smoother along New South Road at the LIRR crossing since the tracks were recently repaired and the roadway was regraded. Thanks to Executive Board member John Simonello for coordinating this project with the LIRR and the Town of Oyster Bay. The HGCA has been contacted by a law firm representing a developer with plans to sub-divide the existing dry cleaners located at 425 Jerusalem Avenue into a dry cleaners and nail salon. A survey of the Block Captains in that area revealed that they did not see any negative impact resulting from the development and that position has been transmitted to the law firm. 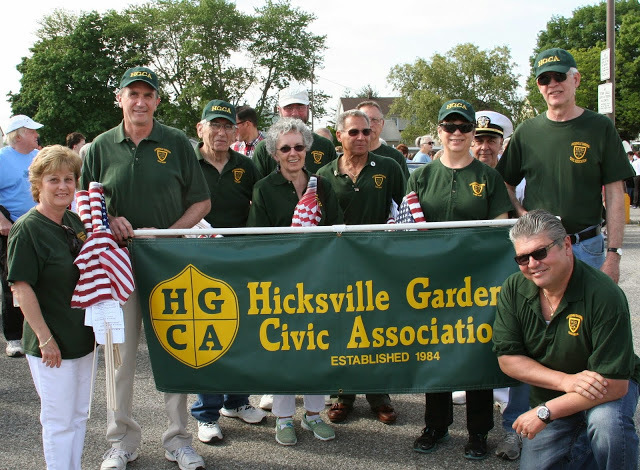 In response to requests by the Hicksville Gardens Civic Association and the Hicksville Fire Department the state recently painted a white box at South Block Side Road”. A “spill back” situation was occuring at the intersection with vehicles blocking access and egress from Millwood Gate. This was caused partially by the recent signal lights installed at the “5 Corners” intersection. This not only caused a blockage at the location but also created a safety hazard by delaying the response time by local volunteer firefighters.